In December of 2015, World of Warcraft was under 5.5 million subscribers and had announced they would no longer be sharing active account numbers with the public. Since the game’s original release in 2004 and the massive success that had followed, even at 5.5 million players, the game still stood as the powerhouse of the MMO market with one of the largest active communities. With the release of the in-game store in 2010, players could purchase special mounts, pets, tokens and character services by spending real money. With the profits generated through this new player-accessible market, Blizzard took the idea of combining it with a charitable one and the rest is now history. Blizzard’s Brightpaw pet released in 2015 through the in-game store. Revenue generated through the pet’s player purchases generated $1.7 million in donation money towards the Make-A-Wish Foundation. Near the end of 2012, the Cinder Kitten pet was added to the in-game store in a patch update. Until December 31st of that same year, 100% of the proceeds generated from player purchases of the pet went to the Red Cross’s Hurricane Sandy relief effort. 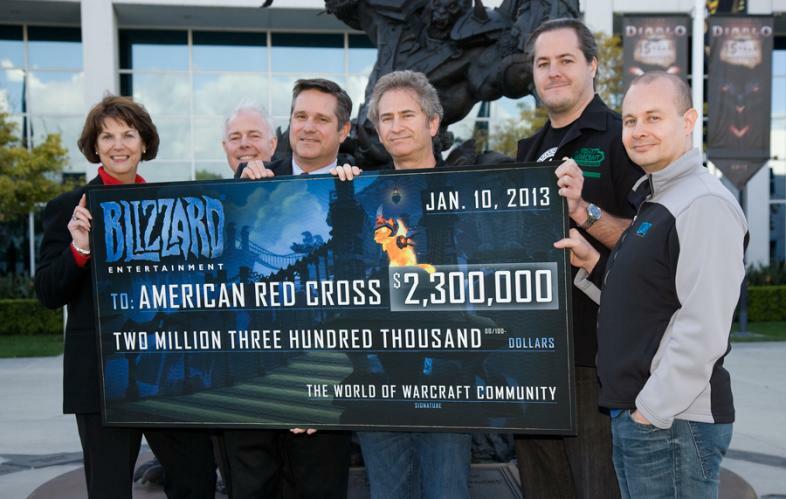 This resulted in a $2.3 million donation from Blizzard and the players of World of Warcraft. In 2015, Blizzard again released another, new pet named Brightpaw at the same $10 price tag. With all of the proceeds going this time to the Make-A-Wish Foundation, the developer announced they had raised over $1.7 million in play purchases that would be given to the foundation. The most recent replication of this charitable move by Blizzard was the release of another pet by the name of Mischief in 2016. A small, Legion-expansion themed cat, it was announced this pet generated $2.5 million in donations. With the recent release of Legion at the time, it is believed that with more players back in the world of Azeroth, more adoptions of Mischief took place and in turn created more in donations. A screen shot of the Legion-themed pet, Mischief, in all his glowing green and demonic splendor. If there is one thing WoW has taught us over the years, is that it can be a great place of human interaction with the outside world it allows us to escape from. While the infamous “Corrupted Blood Plague Incident” from 2005 stands a more real world, scientific study on how disease can quickly spread through a population, there are other observations such as the pet donations over the years. Between the Cinder Kitten, Brightpaw and Mischief purchases, players donated in total $6.5 million to charity. While what players get in return are things they themselves can enjoy in-game in the form of these pets, it also shows the effect of charity and it producing a good thing. As WoW continues to move forward, it is likely we will see these good-willed opportunities continue when knowing how much of an impact they can make.